"What can I grow with Hydroponics?" probably, the answer is you can grow anything. That's true, but not many will flourish in a water-based environment while others will never reach their full potential. Well, today I'm going to make it easy for you to choose the perfect plants to start. Below you'll find a list of some edible easy-to-grow plants (infographic included) that work very well with the Hydroponic cultivation. Lettuces, the perfect ingredient for the salad sandwich in your kitchen, are probably the most common vegetables that are grown in Hydroponics. They grow super fast in a hydroponic system and are fairly easy to take care of. Lettuces can be grown in any Hydroponics system, including the NFT, Aeroponics, Ebb & Flow, etc. This vegetable is no doubt a great plant if you just start with Hydroponics. Many types of tomatoes, including traditional and cherry ones, have been grown widely by Hydroponic hobbyists and commercial growers. Botanically, the tomato is a fruit, but most people whether sellers or consumers consider it as vegetables. One thing to keep in mind is that tomatoes require much light. So be prepared to purchase some grow lights if you want to grow indoors. Radishes are another vegetable that makes a good flavoring mix with other vegetables. Radishes are one of the easiest vegetables to grow - either in soil or hydroponics. It's better to start from seeds, and you can see seedlings within 3 - 7 days. Radishes thrive in cool temperatures and do not need any lights. Kale is a very nutritious and delicious-flavored plant for home and restaurant dishes. It is a great vegetable for a healthy person with proven health benefits. The great news is that people have grown Kale hydroponically for so many years, so definitely you can do it in the water system. And in fact, it's easy to grow and thrive well in this system. Cucumbers are a common vining plant that is grown at home and in the commercial greenhouses. They enjoy a rapid growth under sufficient condition and hence give very high yields. There are several types and sizes of cucumbers, including the thick-skinned American slicers, long thin-skinned seedless European, and the smooth-skinned Lebanese cucumbers. All can grow well in Hydroponics. Cucumber is a warm plant so be sure to supply it with enough light and temperature. The favorite vegetable that can be either eaten raw or cooked in your meal does grow well in the water-based environment. Spinach is a cool plant, so it does not require too much light. You can harvest it all at once or tear off some leaves. You can get up to 12 weeks of continuous harvesting under a good condition of climate and growing environment. One of the most productive and low-maintenance vegetables that can be grown hydroponically. You can choose the types of beans you can grow, including green beans, pole beans, pinto beans, lima beans. You will need a trellis or something to support the plants if you plant pole beans. Seed germination usually takes 3 - 8 days. Harvesting begins after 6 - 8 weeks. After that, you can continue the crop for 3 - 4 months. It's easier to grow chives from a plant in a Hydroponic system. So better to get them from your local garden supplies. Under a standard growing condition, it takes six to eight weeks before it is fully mature. Then you can harvest it regularly - it needs 3 - 4 weeks later to fully regrow. Chive requires lots of light, 12 - 14 hours of light each day. Basil thrives very well in a hydroponic system, and it is indeed among the most grown herbs in Hydroponic. You can grow basil in NFT or Drip system. Once this plant reaches the mature stage, you harvest and trim it weekly. Basil needs lots of lights. It will undergo a poor growth when you do not provide it with over 11 hours of lightning. Mints, mainly peppermint and spearmint, have been grown extensively whether in soils and hydroponics. Their aromatic compounds in mints are refreshing, and pungent, which proves their use as a flavor for food and beverages. Mint roots spread so quickly, making it ideal to grow with Hydroponics. Strawberries are well suited for hydroponic growing. 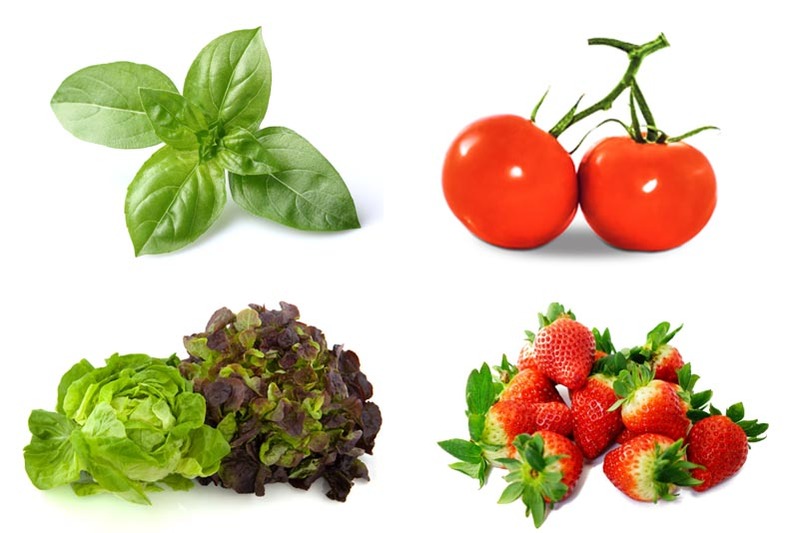 In fact, these fruits are one the most popular plants grown in commercial hydroponic production. They have been grown in large-scale NFT systems by the commercial farms for decades. However, you can still enjoy delicious fresh strawberries to feed all your family by growing them at home and harvesting the fruits all year long. Blueberries, a great fruit high in vitamins for your meal, can be grown well in Hydroponics. This plant takes longer to bear fruits than strawberries, often until the second years. They are usually grown in an NFT system. It's hard to plant blueberries from seeds, so transplants are recommended. You can either start growing them from seeds or plants from the local garden supplier. Recommended varieties for hydroponically growing are Jalapeno, Habanero for hot peppers; Mazurka, Cubico, Nairobi, Fellini for sweet peppers. Again this does not mean that you cannot grow these types of plants, they are just more challenging to grow in Hydroponics. But experienced growers have planted them in their soilless systems for years and enjoyed excellent yields. Plants that take up large spaces. If space is limited, it's best to avoid squash, melons, pumpkins, corn and other large plants. It doesn't mean that you cannot grow these plants, but in a narrow area, it's harder to take care of plants and the yields are not as good as other places where these plants have rooms to grow. Again, it's hard to care for plants that need a lot of depth for root. So this is not recommended for beginners. Potatoes, carrots, turnips fall into these types. For root crops, you need a substrate with sufficient length and high depth to support the roots. And these types of plants tend not to give as good results as they are in the soil. If you have a large growing environment like a greenhouse, patio, you can set up a more advanced system and grow sizeable plants, root veggies, and other hard-to-grow ones. That environment is perfect for you to try with any plant. As someone new to Hydroponics, it would be smart to go with easy to grow plants that enjoy rapid growth. We have mentioned many examples above. As a consequence, you can get the result and learn the experience fast, then feel inspired to move to something harder. Experienced Hydroponic gardeners may have adequate knowledge of the Hydroponics systems and the plants' type they are going to grow. They can strive for other plants like tobacco, large melons, pumpkins, sunflowers, and so on. There are no limits. Choosing a plant to grow in your Hydroponic garden is just the first step. You will need proper knowledge to set up the system. And most importantly, the plants depend on you for their survival. That requires regular huge attention and persistence until you get the yields, just like anything worthwhile in life. If you want to sum up the main hydroponic plants you can start, I have made a detailed infographic about plants (vegetables, fruits, herbs) that are best suited in Hydroponics.